The summer is at our doorstep! What better way to begin your day than coming to your EC Toronto school every morning, hair floating in the fresh wind, proudly riding your Bixi? But what is this mysterious Bixi? 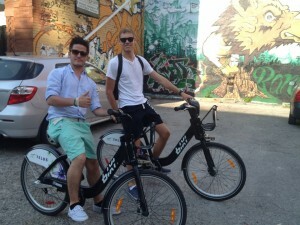 Bixi is a very innovative company that launched its bicycle sharing system in 2008. The system has been developed in Montreal, capital city of Quebec, French Canada. As this was one of the largest projects in Transit during those years, Bixi expanding around the world. This new system was ranked 19th in Time Magazine’s 50 Best Inventions of 2008. BIXI was created for short trips in large cities: It is a useful transit solution which consists of renting a bike from a station A to go to a station in the city. Today in Toronto, there are not less than 80 stations and 1,000 bikes. The Bixi bike season has begun in Toronto! Bike stations are up and running as of today and are installed everywhere Downtown. There are two steps to follow if you want to become a Bixi rider. First, you can obtain a “Bixi Key” through a long-term subscription on the website (monthly or annually). In Toronto, this fee is $111 (taxes included) for a year, $47 a month. If you are a one-time user you can also acquire a 24 or 72-hour access provided by the bicycle station (all stations are equipped with touchscreen-operated terminal, powered by solar panel). The occasional fee is $5. After your registration, you can take out a bike as many times as you want! Finally, Bixi is a young and dynamic company. Different worldwide teams organise special events, such as “Coldest Day of the Year Ride” in Toronto, which occurs the 3rd of January! Thanks to this system, take one when you need one, and leave it at any station when you arrive at your destination! No longer need a place to store your bike, no worries about theft, and above all, no need to spend a penny to have a cool ride! So what do you think, EC Toronto students? For 30 minutes or less there are no additional fees (apart from registration prices). Fees for longer trips apply. Check the website if you want to know more! Get some fresh air before and after school! Here, you can look for the nearest Bixi station, the weather and even plan your Bixi trip! Check out the website for special events and be involved in the BIXI community, everything is there! No more questions. For running errands, getting to school or visiting friends…EC Toronto students can go BIXI! !